Newly married couple Ceri and Claire Morgan were hanging out and catching up on some TV with their dog, Teeto, when a program came on that would change their lives. The program featured a dog who had been acting lethargic and limping, and then was diagnosed with canine cancer. “I looked at Teeto and he looked at me as if to say, ‘You should watch this,’” Ceri explained. Teeto, a 5-year-old American Bulldog, had been limping lately too — just like the dog on the TV show. The Morgans made an appointment for Teeto right away. Ceri took the big Bulldog to his veterinarian to make sure that the limp was nothing serious. But then the vet asked Ceri to sit down, and he knew that something was definitely wrong. 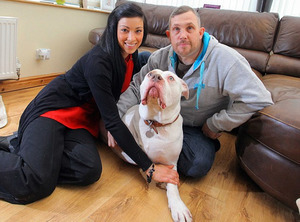 Ceri told Wales Online that he “cried like a baby” when the veterinarian broke the tragic news — Teeto had cancer. The veterinarian explained that Teeto’s only chance at survival was expensive medical treatment. But Ceri and Claire were willing to try anything for Teeto. “We told the vet that it didn’t matter about the money, just do whatever it takes to make him better,” Claire said of the couple’s desperate wish that Teeto be saved. Ceri and Claire knew Teeto’s treatments would break the bank, so in order to cover the vet bills — which would amount to more than £7,000 (more than $11,000 USD)— the newlyweds knew what they needed to do. After celebrating their wedding in a lavish ceremony at the ritzy Vale Resort in Wales, the new Mr. and Mrs. Morgan had planned a fun-filled honeymoon in Las Vegas. But now, with Teeto’s life at stake, Ceri and Claire knew what was more important: They decided to use their honeymoon money to help pay for the surgery and chemotherapy Teeto would need to get better. So, with their honeymoon fund zeroed out and with the help of generous family members and friends, Ceri and Claire gave the okay and Teeto’s treatments began. The cancer had ravaged the shoulder of Teeto’s front right leg, so doctors had no choice but to amputate. The gentle giant was also put on a strong round of chemotherapy to eradicate any cancer cells that might remain. Every three weeks, Ceri, Claire, and Teeto must travel more than 80 miles from their home in Morriston, South Wales to a veterinary specialist facility near Bristol for Teeto’s chemo treatments. Claire told the Daily Mail that Teeto is getting around great after his treatments and has learned to adapt to walking on three legs instead of four. Ceri and Claire explain that they have no regrets after giving up their dream Las Vegas honeymoon; after all, their happy family isn’t complete without their buddy Teeto. “We can go on honeymoon again when we’ve saved up, but a dog is for life and we want Teeto around for a lot longer,” said Ceri.